BY PATRICK WATSON : US stocks hit new all-time highs this month. Despite rich valuations, buyers think they’ll still go higher. One reason for this exuberance is the rise of passively indexed ETFs. Rather than go to the trouble of picking individual stocks, people dump their cash into index ETFs. The ETF sponsor then buys every stock in the index—even the ugly ones. Profit growth seems to justify this, even in the broad indexes. FactSet Research estimated that combined profits in the S&P 500 companies will rise 6.5% in this year’s second quarter. So, “combined profits” means some companies (and sectors) performed better than average, some worse, right? What we really have is one sector growing profits at a gangbuster rate. The others, not so much. Here are the sectors that comprise the S&P 500’s 6.5% earnings growth this quarter, in ascending order. The 6.5% average disguises considerable variation. 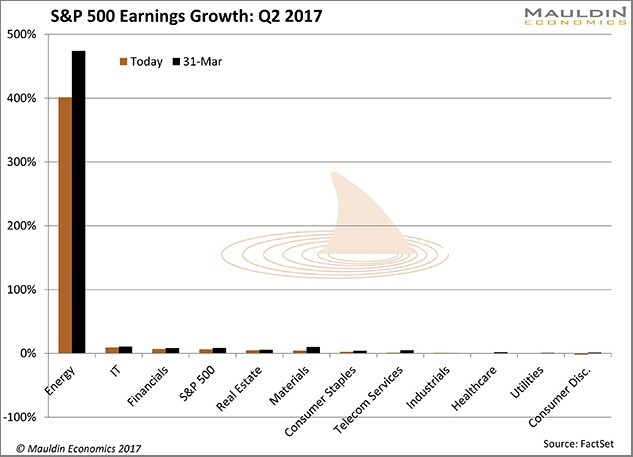 Five of the 11 sectors have 1.3% earnings growth or less. Two are actually declining. Then there’s energy, where earnings growth is not just above above-average, but 61 times more than average. Earnings growth is way out of balance. The energy sector’s big recovery skews the average. Remove it and the average drops from 6.5% to 3.6%, according to FactSet. In other words, almost half of this quarter’s S&P 500 earnings growth originates in a single sector that probably won’t keep growing at its present rate. Yet, money still pours into index ETFs. The analysts behind these estimates presumed the average Q2 oil price to be $51.96 per barrel. It’s an optimistic estimate, to say the least. Oil traded below $50 the entire month of June and most of May as well. In any case, this industry has bigger problems, though. Economic theory tells us that “the cure” for excessively high or low commodity prices is more of the same. 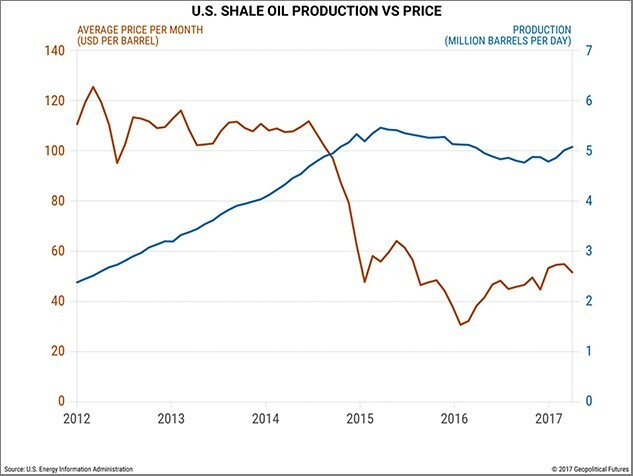 High prices encourage more production until excess supply makes the price fall. Conversely, low prices cause production cuts that reduce supply and ultimately raise prices. Oil prices plunged in late 2014, from over $100 to half that level. That should have led to lower production, but it didn’t. Hence the present oil glut. Apparently, the rules have changed. Technology now is a big factor. New exploration and drilling technologies have made production costs fall sharply in the last three years. Many companies can produce oil and gas profitably even at today’s prices or lower. Some producers are so leveraged, they’ll have to keep pumping even if prices drop further. They need revenue to stay current on their debts. Any sudden supply disruption could push prices way up. A hurricane damaging Gulf Coast energy facilities or warfare in the Middle East would do it, at least temporarily. But the broader trends don’t look good if you need oil to stay over $50. While the S&P 500 earnings outlook looks impressive mainly due to a bounced-back energy sector, technology and financial services look impressive as well. But they depend on energy, too. If oil prices fall enough to hurt the energy sector, some producers will miss loan payments. That would be bad news for the lenders in the financial-services sector. Likewise, energy companies won’t buy as much hardware and software if they have to cut back on drilling activity. Not good for some technology companies. Bottom line: the bull market in US stocks will be on even shakier ground if oil prices dip below $40 again. In any case, earnings growth probably won’t continue at current rates unless oil prices climb higher. Opportunities will still exist, but throwing money into an index ETF isn’t the way to find them. Millions of investors will learn that lesson the hard way. Don’t be one of them. We live in an era of rapid change… and only those who see and understand the shifting market, economic, and political trends can make wise investment decisions. Macroeconomic forecaster Patrick Watson spots the trends and spells what they mean every week in the free e-letter, Connecting the Dots. Subscribe now for his seasoned insight into the surprising forces driving global markets.